I am creating a custom action for our TFS2012 Work Item for State Transitions. I found a multitude of resources on how the get the ball rolling create a WorkItemChangedEventHandler class ; but I quickly hit a snag. I could not find WorkItemChangedEvent for the life of me. 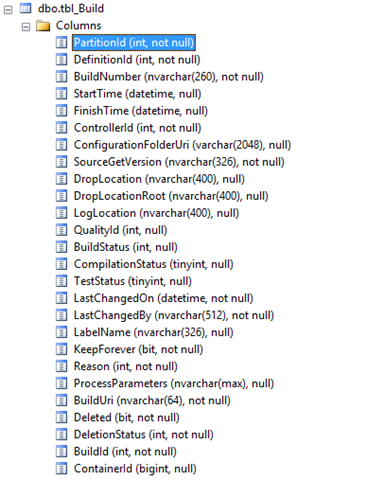 I was expecting to find WorkItemChangedEvent in the assembly Microsoft.TeamFoundation.WorkItemTracking.Server but due to a poorly documented reason there are some dependencies with the assembly Microsoft.TeamFoundation.WorkItemTracking.Server.Dataaccesslayer. Both assemblies must be present to access any members of Microsoft.TeamFoundation.WorkItemTracking.Server. Both of these assemblies can be found on the TFS2012 Server machine under the path %ProgramFiles%\Microsoft Team Foundation Server 11.0\Application Tier\Web Services\bin. If you are having trouble finding historical build data using the TFS API, build information can be found in your Team Foundation Server Databases . The table Tbl_Build keeps a log of all your historical builds including, build number, start and stop times, controller id, drop location, and statuses. This can be and extremely powerful tool to look up Build Id values to look up historic build logs which contain detailed reports (as covered in Tfs Build Log: Querying Build Log Data). The CompliationStatus and TestStatus columns are trickier to deal with than BuildStatus column. Where the BuildStatus is pretty well self explanatory, both the CompliationStatus and TestStatus are heavily based on user definitions within the Build Process Template. That is to say that a Complitation/Test failure may not mean what you think that it means out of the box. Please review your Build Process Template and see how the CompliationStatus and TestStatus are set. Be sure to check this out my previous post Tfs Build Log: Querying Build Log Data to learn how to programmatically read historical build data. Team Foundation Server Databases. MSDN Library.